Yesterday I joined London’s Olympic party, when we went to see the gymnastics at the North Greenwich Arena, better known as the O2 (but the company isn’t an Olympic sponsor…) or in its prior guise as the Millennium Dome. It was the women’s artistic individual overall final. All too brief – but I’m glad we made it, for once in a lifetime! The event was due to start at 4.30pm, but we decided to make a day of it. We set off at 11.30 in the morning, and took the river bus to Greenwich. We opted to lunch there, about 2km from the arena, since we’d heard so many scare stories about the dominance of the Olympics sponsors (McDonalds for restaurants, Heineken for beer, etc). Greenwich town is near another Olympic venue – Greenwich Park for equestrian events – so had plenty of Olympic atmosphere. After a long but rather mediocre lunch at a Tex-Mex restaurant, we set off by bus for the arena, as directed by one of the many Olympic volunteer helpers. London Transport nearly undid the glow of goodwill by taking out of service the bus that was due to take us, with a long wait for the next one shown on the indicator. But another bus turned up, untracked by the indicator, a few minutes later, with space enough for everyone. At the venue we were cheerfully herded through the security checks. All very quick, but it was quite early (about 3pm). It didn’t help to try and figure out what was going on in the complex system of queues and barriers, just follow the crowds and go where people were pointing. In the Dome we found a profusion of restaurants (but no McDonalds, or Burger King, come to that), with no conspicuous restrictions. The scare stories were overdone. But a sign at one of the bars in the arena itself said “proud only to accept Visa cards for payment” or some such. I think most people, me included, find that the Visa monopoly on payment cards quite offensive, so they should have put “ashamed” instead of “proud”. We paid cash, which was fortunately allowed for a bottle of water (though not for tickets or merchandise…). So we took our seats perched up high in the arena with over an hour to go. But they kept us entertained and warmed us up, with videos and explanations and previews, and finally a dance by the English Ballet from Swan Lake (from their current show which coincidentally we are due to see next week). And then it all started. There were 24 gymnasts (limited to two from each country – a bit hard on the Americans and Russians) divided into four groups, each taking on one piece of “apparatus” – the beam, the vault, the uneven bars and the floor (which is not an “apparatus” in my pedantic book) – the last set to music. It was quite a lot to take in. The top contenders were all in one group, so the pros could concentrate on just them. But the two British contenders (Hannah Whelan and the 15 year old Rebecca Tunney) were in another group – and the predominantly British crowd were keen to give them full support. And again, the floor exercise tended to draw attention, with its sheer size and, of course, the music. There was a screen and a scoreboard, and a bit of commentary – but it is easier to follow on the television at home. There were one or two performances that I wanted to see but missed – like the American Gabrielle “flying squirrel” Douglas on the uneven bars. The organisers could have helped us a bit more. They were selling a daily magazine for £5 on the day’s events, but this gave just two pages to the gymnastics, gassing on about the two British girls, with two thirds of a page on the the girl they considered the favourite (the US Aly Raisman), who did not end up with a medal, plus a brief profile for the main Russian contender (Victoria Komova) and an even shorter mention of her team-mate (Aliya Mustafina) – these ended up with Silver and Bronze respectively. So they almost failed to mention the winner, Ms Douglas, at all! Still, better than the forecast at the beginning of the magazine which predicted an American who failed to qualify for the final at all (Jordin Wieber). This whole things misses the point about people who turn up for the events – who are unlikely to be attending more than one event in a day – so don’t want masses of superficial waffle on everything – but some substance on the event they are watching. A list of the 24 finalists, and their scores in earlier rounds, and perhaps a little profile would have added to the event. All the magazine could do was while away 15 minutes on the train home. No matter! It was lovely to be there, and to make your own choices as to what to follow, rather then the choice of some television producer. The performances were astonishing. I am no gymnast, and don’t know much about the sport. But I am irrestiably drawn to it each Olympics, and have been watching the drama of the team finals and the men’s event on the television. There was a thrilling finish on the floor exercises as the Americans and Russians slugged it out. But Ms Douglas was already in a significant lead, the others having wobbled a little in earlier rounds and she clinched the deal with confidence – quite wonderful to watch. Interestingly the leading women contestants did not seem to be so pally with each other as were the men – they seemed a bit more absorbed in their own worlds. Tears from the Russians in the end as they failed in their bid for Gold, in spite of the American favourite having come a cropper in qualification. Alas for Ms Whelan. She was already struggling after a poor beam and indifferent floor, when she came a cropper on the vault and score zero points (the only gymnast to do so on any apparatus) – she ended up 24th by some distance, though she would not have done much better in the placings if she had got a middling score there. Ms Tunney did better, ending up 13th after an uncertain start on the beam -she should still have her best years ahead of her. 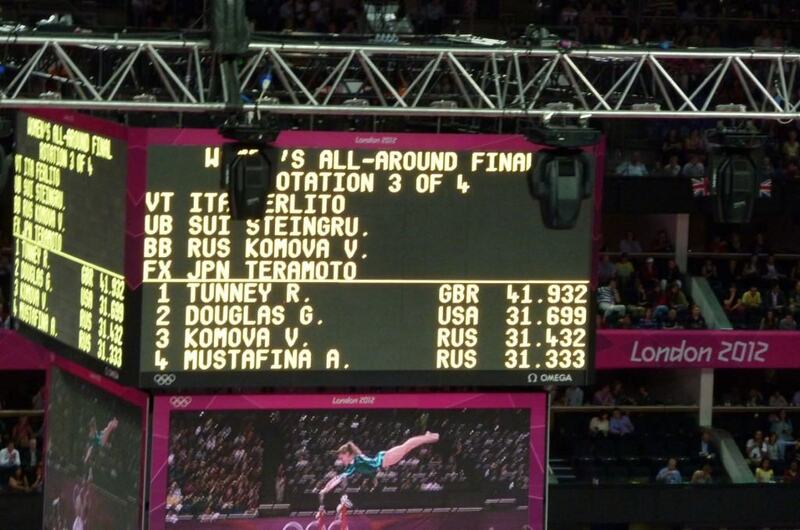 After her vault (she led and so was the first score to be posted in the third rotation), she even topped the leader board for a minute or so – as my picture shows. What a wonderful experience! My head had was never really convinced by the economic case for London hosting the Olympics, and still isn’t. But the gain is deeper than economics. It makes us Brits feel world class again. The organisation is generally excellent, the spirit wonderful. The tone set by the opening ceremony was shear genius – celebrating Britain inclusively for what it is, and not trying to wallow in past glory. We can be cynical about lots of it (the scare stories about transport chaos, the sponsors’ monopolies), critical about details (the daily magazine) – but it feels good.